Keeping up with the breakneck pace of social media can run you ragged. Is it time to tweet? Post to Google+? Pin a great-looking image? Publish a blog post? The social media editorial calendar is built on your goals and on the needs and desires of your audience. Working in tandem with the messaging map, the editorial calendar guides you to compose content that you’ll publish and share in your social networks, and some of this content can be scheduled. We’re not recommending that you create formulaic or canned posts. We’re encouraging you to be strategic, remain on-message, and clearly focus so that your messaging is more effective. We’re giving you permission to schedule some messaging in advance to help alleviate the time pressures of being continually bound to your computer. Experiment with easy-to-use and affordable social media management tools that let you schedule posts and tweets to a number of popular social networks, such as HootSuite, Buffer, and SproutSocial. 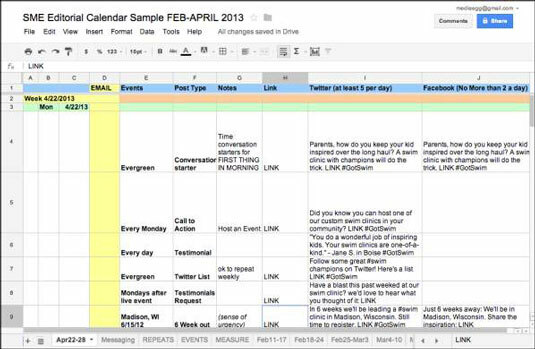 You can use a number of tools to develop an editorial calendar. Start simple with an Excel spreadsheet or, if you’re familiar with Google Docs, a Google spreadsheet (our favorite). Then you can easily share with others and collaborate. Another online shared option is Zoho Docs. Create a quarterly (3-month) spreadsheet. Adding more months to the spreadsheet can become unwieldy; using fewer than three months creates more documents to manage. Create weekly tabs to cover the months you’ve specified. Give the tabs names to help you recognize the week, such as Dec10-16, Dec17-23, and so on. Make a Template tab for weekly messaging. This template serves as a baseline guide for subsequent weekly pages, to remind you of key topics and messaging. a. Day/Date: The day of the week (Monday, Tuesday, Wednesday, and so on). b. Events: Online or offline events that also trigger messaging. c. Post Topic: Custom topics that you’ve created and types of posts that you’ve identified as interesting to your audience. d. Link: The location where you want to drive traffic. Most posts should have links — to your own content or to others’ content you’re sharing. e. Twitter/Facebook: Rows for precrafting a number of tweets per day and a spot for a post based on that day’s topic. f. Other Channels: Columns for additional channels as needed. Each channel has its own rhythm and content needs. If you’re publishing regular video, for example, add YouTube. If you’re trying to reach a more professional audience, add LinkedIn. Add repeatable messages to the Template tab. These messages are vital to helping you achieve your goals, and they can be time sensitive, such as an upcoming or ongoing Hire Us event. Even if you’re repeating a message, revise the wording so that you don’t sound like a broken record. Also note how topics in the Post Topics column repeat weekly. Copy and paste the template into each week’s tab. Add the base template before filling in new content for each week so that you don’t accidentally paste over your work. Begin filling in the blanks with conversational messages. Don’t rely solely on the core topics and messaging in your calendar. Come up with additional messaging that is complementary and relevant. We recommend filling in the editorial calendar at least a week in advance. Repeatable topics and messaging can be carried out over weeks at a time. Evergreen content (or content that is always interesting to readers because it isn’t tied to a timeframe) can be moved around to accommodate more pressing messages. Look forward to what is happening, or to what you want to happen months from now. Keep holidays, special events, and seasons in mind if they affect your business. Events that have fixed dates can immediately trigger messaging that leads up to the events and encourages people to register or to buy tickets. Craft this messaging as soon as you confirm the date, to ensure that they’re added to your calendar. Come up with 15 different ways to say, “Come to our event in September,” and then schedule those messages across your social media engagement platforms during the weeks leading up to the event. This saves you from trying to remember every week and prompts your community to remember, purchase tickets if necessary, and then attend. Taking the time to plan strategically around the core content you will publish during the next few months or the next year supplies you with a roadmap. Stay flexible in order to adapt to your roadmap and improve it. Having a social media messaging map and a social media editorial calendar in hand gives you more of a framework for establishing your presence in your social media channels. These tools keep that presence consistent and fresh. Maintaining an editorial calendar for blog posts and campaigns is also useful. Your community needs to hear from you in real-time. If you run your SME on autopilot, you risk turning off supporters and having them “unfollow” you. Use the calendar to plan ahead and to schedule some of your social media activity, but set time aside to regularly check in with fans and followers to reply to their queries, acknowledge their mentions, and engage with them.